This is the thirteenth in a 24-part series looking at every episode of “The Jetsons” TV show from the original 1962-63 season. The 13th episode of “The Jetsons” originally aired on December 16, 1962, and was titled “Elroy’s Pal.” The episode looks at Elroy’s obsession with the fictional TV show “Nimbus the Greatest,” about a heroic fighter of space pirates. The show is sponsored by Moonies breakfast cereal and Elroy enters a contest for the chance to meet Nimbus in person. As it turns out, Elroy wins the contest but the actor who plays Nimbus is ill and can’t visit Elroy at home. When George finds out that Nimbus won’t be coming he devises a plan to dress as Nimbus himself but the original Nimbus comes anyway and Elroy learns that even though he can be strict, his father loves him. The 1950s was a time of rapid growth for the medium of television. American households with TVs went from just 9 percent in 1950 to about 87 percent by the end of the decade. Unlike the largely ad-agnostic programming that the networks produce today, many TV shows of the 1950s had a single sponsor. As production costs rose this single sponsor model became unsustainable and multiple sponsors in the form of 30- and 60-second commercials became the norm by the mid-1960s. As the Journal of Advertising noted in their Fall 1998 issue, “During the 1950s most children’s programs, and many adult shows, were controlled by the sponsor and its advertising agency, which often packaged the program, commercials and all.” This integration meant that you saw breakfast cereals that could sponsor contests fully integrated with the show. Cereal made up as much as 23 percent of ads on children’s TV in the 1950s and the emergence of the Space Age in the late 1950s meant that this was a perfect combination for “The Jetsons” to depict. Elroy’s Nimbus costume and action figure show that he’s committed to the show, just as kids of the 1950s were buying all kinds of products to show their commitment to Captain Video, Tom Corbett, Space Cadet, Captain Midnight, Space Patrol and Commando Cody. 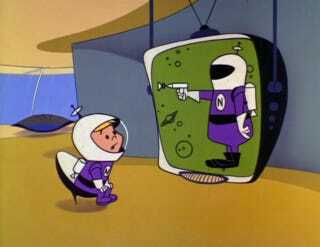 But the tail end of the Space Age would find spacemen less popular on American television, as Boomers grew up and kids like Elroy became less enamored with astronauts and the ray gun culture of their youth.